Explanation: Galaxies are made up of stars, but are all stars found within galaxies? Apparently not. Using the Hubble Space Telescope, researchers exploring the Virgo Cluster of galaxies have now found about 600 red giant stars adrift in intergalactic space. 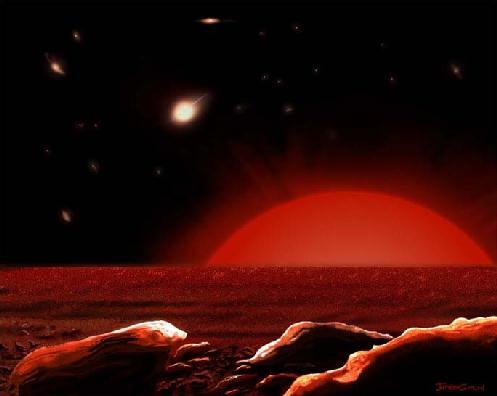 Above is an artist's vision of the sky from a hypothetical planet of such a lonely sun. The night sky on a world orbiting an intergalactic star would be a stark contrast to Earth's - which features a nightly parade of stars, all members of our own Milkyway galaxy. 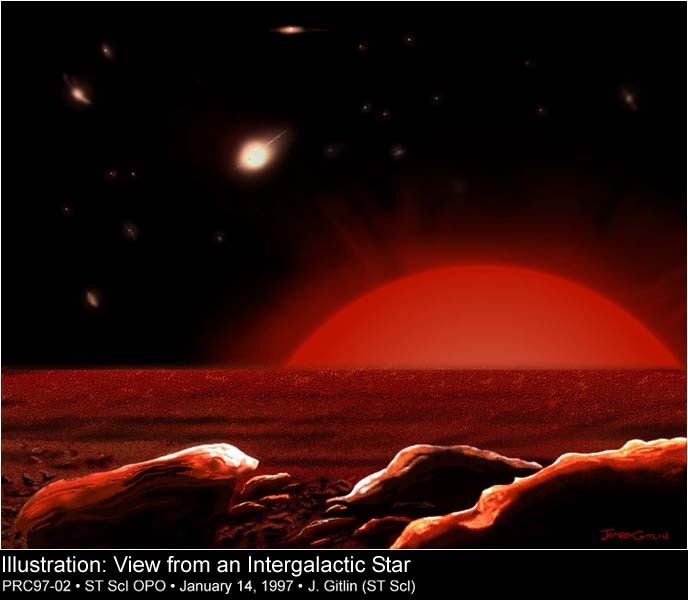 As suggested by the illustration, a setting swollen red sun would leave behind a dark sky speckled only with faint, fuzzy, apparitions of Virgo Cluster galaxies. Possibly ejected from their home galaxies during galaxy-galaxy collisions, these isolated suns may well represent part of a large, previously unseen stellar population, filling the the space between Virgo cluster galaxies.